Cranberry smoothies with strawberries make the best winter smoothies! 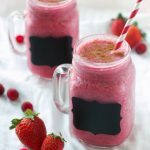 They have a sweet-tart taste that kids love, and they're naturally sweetened - this smoothie recipe is refined sugar free! Add the strawberries, cranberries, vanilla yogurt, cinnamon and cranberry juice to your blender. Blend on high speed until the mixture is smooth, and serve!